Please keep in mind that we won't accept returns on engines. Only warranty claims are addressed. The engines are guaranteed to be good! You are buying a used engine. You are purchasing an engine that is no less than 17-25 years old. Do not expect a brand new factory sealed perfect engine. These engines arent always 100% beautifully clean, but they are guaranteed to be good usable engines that are ready for a swap. Additionally, please contact us for availability. We are having trouble sourcing 7M engines nowadays. 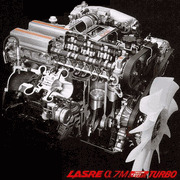 Our engines are complete low mile JDM engines. Engine includes intake manifold, exhaust manifold, turbo, alternator, power steering pump, AC pump, water pump, and sensors needed to make engine run. This is as complete as you can buy used engines. All engines have a 30 day start up warranty on engine internals. This is a great option if you are looking to replace the worn out 7mgte in your car, or if you are trying to get most of the parts needed to swap to turbo. Shipping is truck freight and typically is $275 for lower 48 states. Feel free to contact us at anytime for shipping quote for other locations including Canada.